If there’s one skincare advice I could give you, I’d have to say ‘Wear Sunscreen EVERY DAY ‘…come rain or shine! Say Hello to my new love, the Bioré UV Aqua Rich Watery Essence. 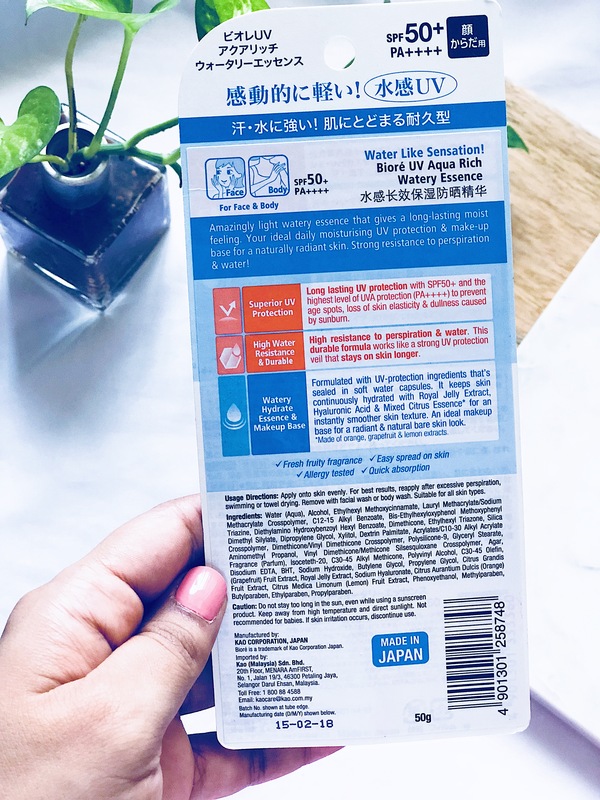 If you follow me on Instagram you’ll know that I was very kindly sent the Biore UV Aqua Rich Watery Essence by a K-Beauty seller called Myra_beautyy and today I want to share with you my first impression on this product….so let’s jump right in! The sunscreen comes in a tube packaging that is packaged inside a carded blister pack. 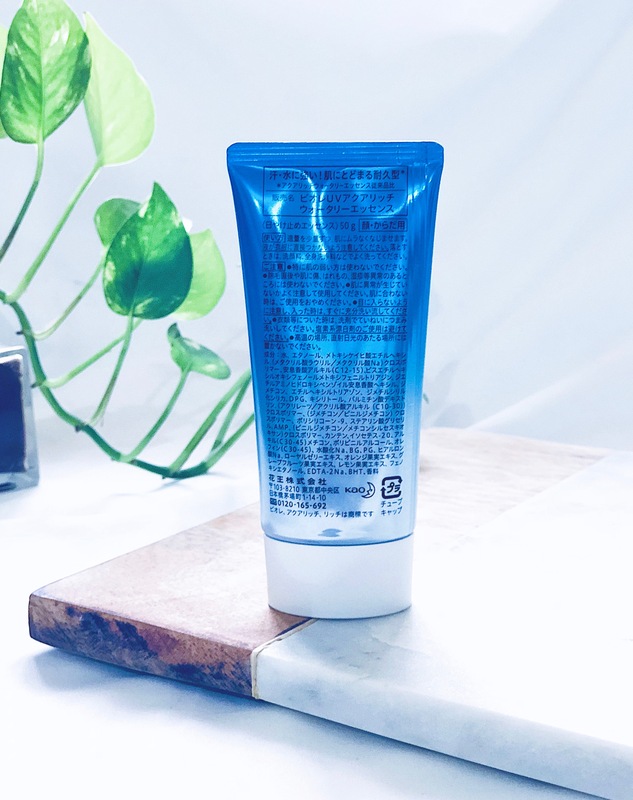 I love the blue colour of the plastic tube packaging and the fact that it’s a squeeze tube with a screw top lid, which makes it so handy and great for travelling. As the name suggests, it is a watery gel texture. 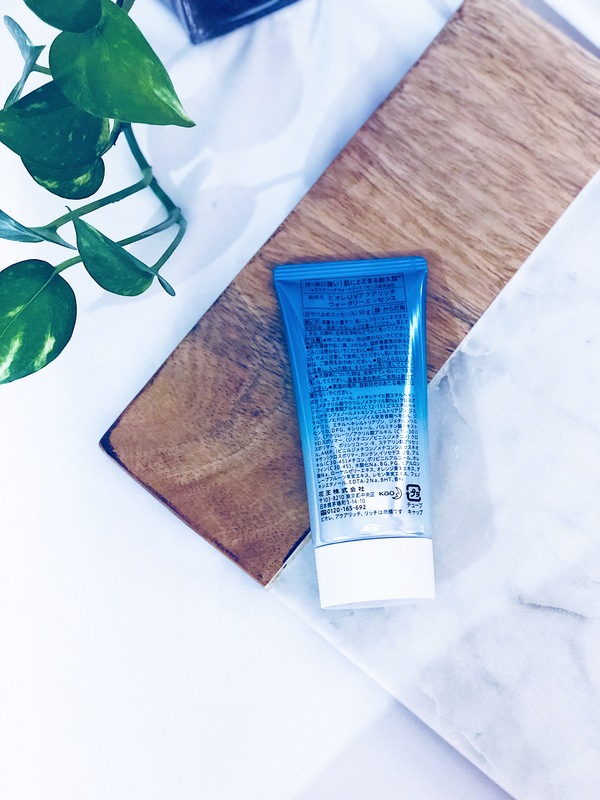 It is neither too thick nor too runny and I was so surprised when I rubbed the sunscreen on my skin to absorb – it literally feels like water and absorbs instantly into the skin! 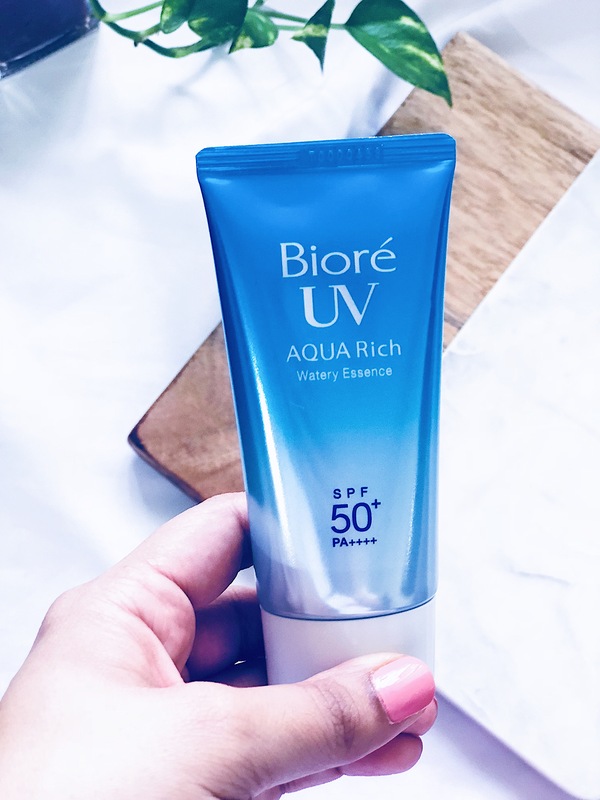 I was hoping that the texture of the Bioré UV Aqua Rich Watery Essence would be somewhat similar to that of the La Roche Posay Anthelios, and I’m happy to say that the Biore UV Aqua Rich Watery Essence is actually much lighter than the Anthelios, making it even nicer to apply in summers. In terms of scent, the Bioré UV Aqua Rich Watery Essence has a very light citrus smell, which does not linger on the skin at all. 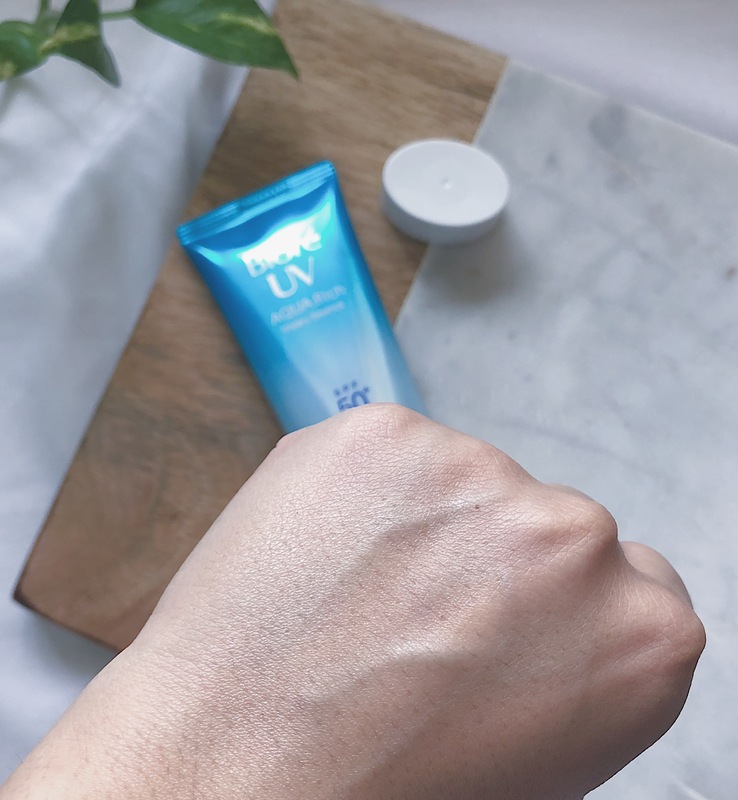 Superior UV Protection: Long lasting UV protection with SPF50+ and the highest level of UVA protection (PA++++) to prevent age spots, loss of skin’s elasticity & dullness caused by sunburn. High Water Resistance & Durable: High resistance to perspiration and water. This durable formula works like a strong UV protection veil that stays on the skin for longer. Watery, Hydrating Essence and Makeup Base: Formulated with UV protection ingredients that are sealed in soft water capsules. It keeps skin continuously hydrated with Royal Jelly Extract, Hyaluronic Acid & Mixed Citrus Essence* for an instantly smoother skin texture. An ideal makeup base for a radiant & natural bare skin look. *Made of orange, grapefruit and lemon extracts. 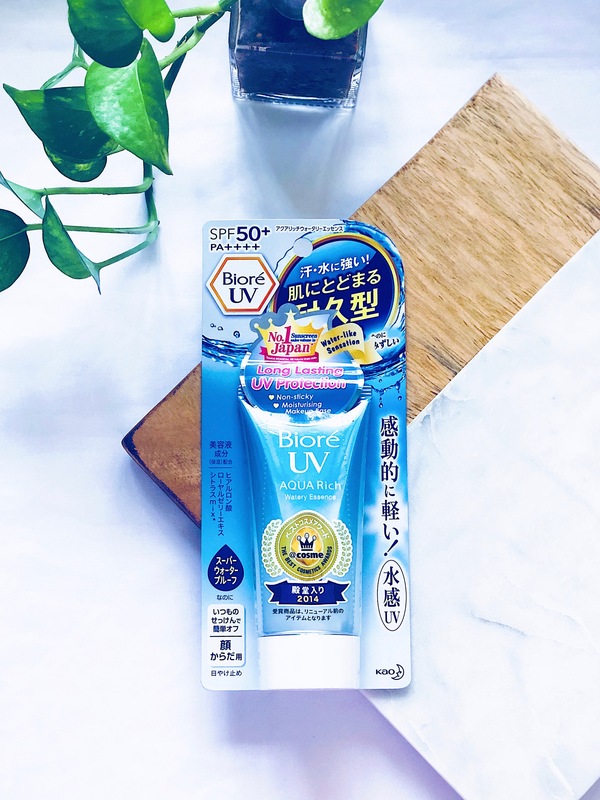 If you are in the market for a good heavy-duty sunscreen that provides both UVA and UVB protection, then this Japanese brand has you covered with the Aqua Rich Watery Essence! 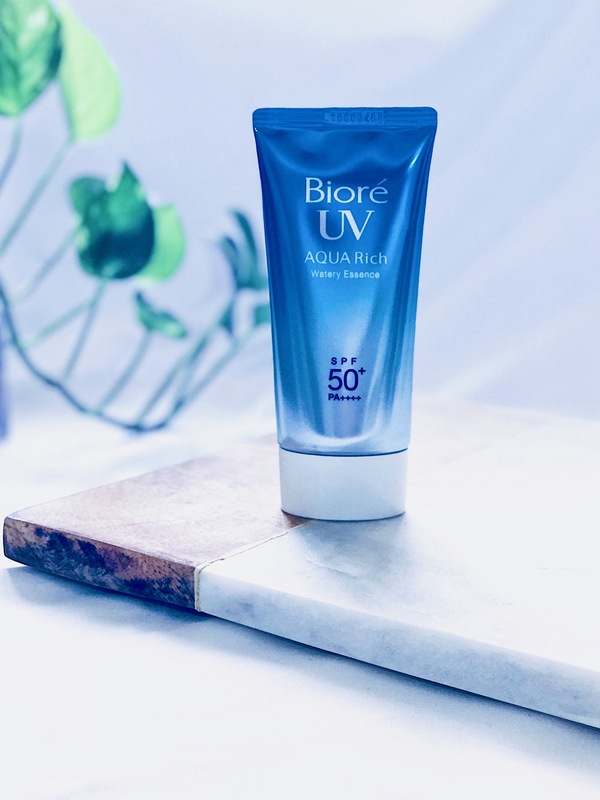 Bioré UV Aqua Rich Watery Essence provides the protection of SPF50 + along with being PA+++ +. Do I agree with Biore’s claims? Yes, I do! I use this as the last step in my morning skincare routine and use a dime size amount to cover my face and neck. Since the texture and consistency is gel-like and thin, it’s really easy to spread the product evenly on the skin. 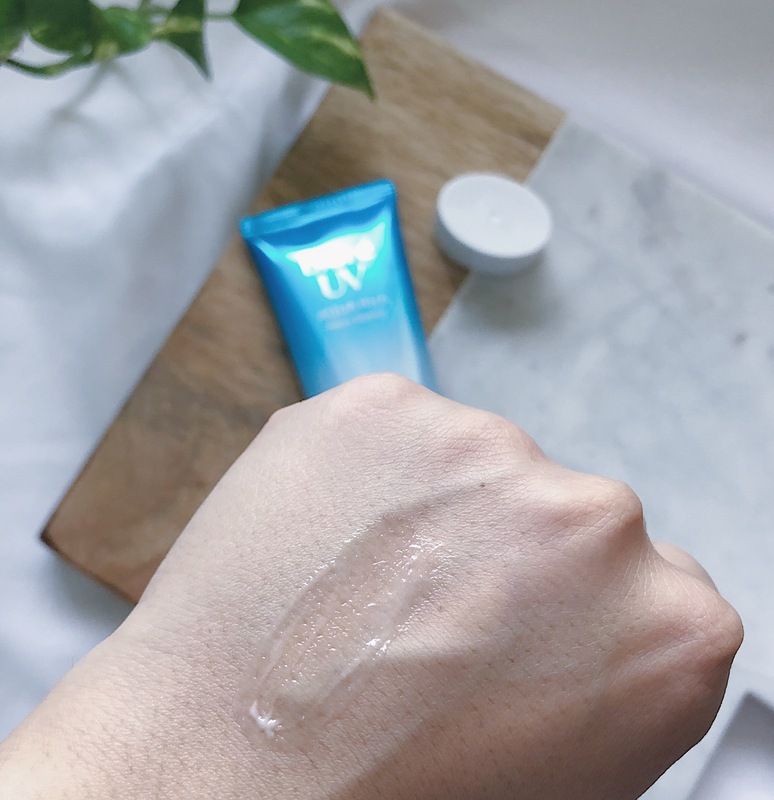 The Bioré UV Aqua Rich Watery Essence sits really well under makeup and I wait for about 10 minutes before applying makeup on top of the sunscreen. I always store my sunscreen in the fridge, because I love the cooling sensation when applied to the skin, especially on hot, humid summer days (which is throughout the year in Mumbai!). 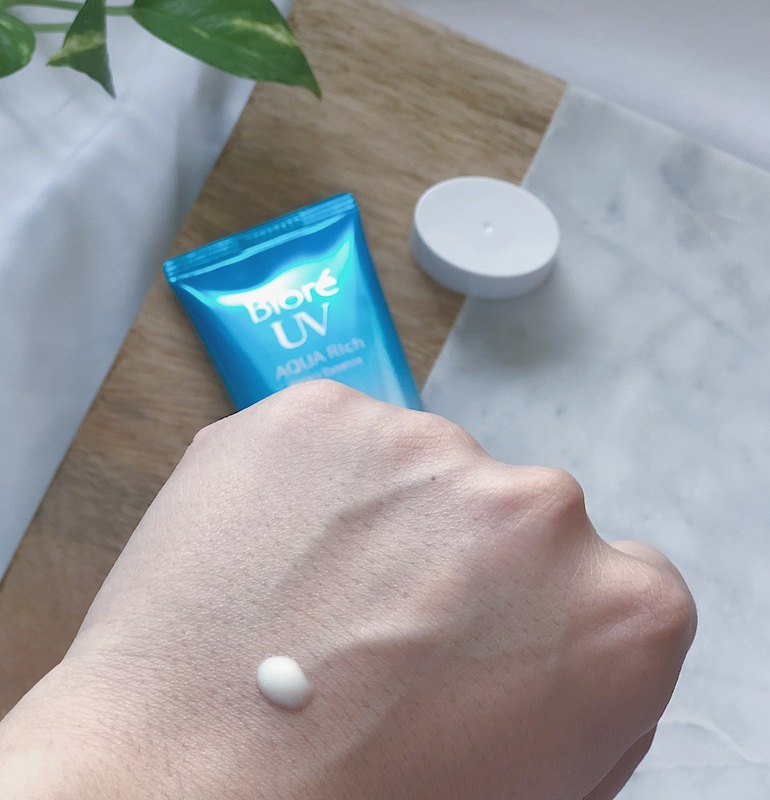 The Bioré UV Aqua Rich Watery Essence literally melts on contact with the skin and does not feel sticky or tacky at all. Instead, my skin feels matte and silky smooth. Also, it leaves no white cast, so that’s a big thumbs up! At first, when I looked up the Ingredient analysis on CosDNA, I was very worried and hesitant because it showed some red flags, and I am currently going through a horrible bout of acne, however, I’ve been using it every day since it arrived and it hasn’t irritated my skin at all. Has it contributed to the acne situation? I’m not sure, but I’ll definitely update you at a later stage. 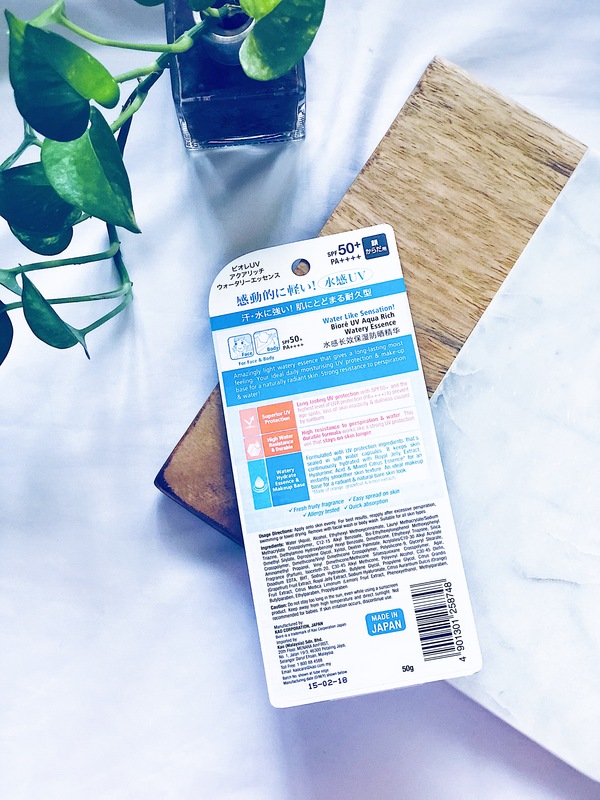 Will I repurchase it and do I recommend it? Yes! Have you tried the Biore UV Aqua Rich Watery Essence? Do you have any favourite sunscreens and recommendations? Please comment below!